Stair ropes,bannister rope,rope handrails and barrier ropes made in the UK by Stair Ropes.com - Rope. Our natural fibre stair ropes are four strand ropes, manufactured specifically to our requirements. They feel comfortable to hold, are well constructed and will prove to be reliable and long lasting. All the ropes we supply for stair ropes, rope handrails and bannister ropes have been chosen for their superior features and sustainable characteristics. Our stair ropes are made from natural hemp and cotton fibres in 32mm or 24mm diameters, a high grade syhthetic alternative to hemp in 32mm and coloured 24mm ropes in polyester, and nylon. See below for more details. We also produce a range of decorative speciality ropes which are individually hand-made to order and combine different rope strands in both natural and synthetic fibres. 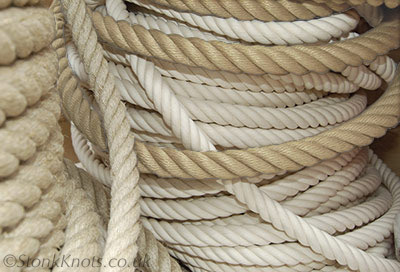 Below are examples of all the ropes we use to make stair bannister ropes, rope handrails and barrier ropes. 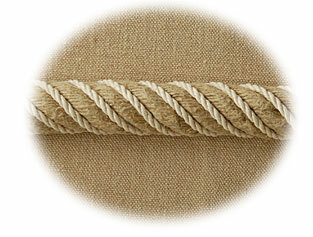 Natural fibre ropes are good choices for a stair rope, bannister rope or hand rail. Ropes such as hemp or cotton feel pleasant to hold and integrate well with both traditional and modern interiors. Traditionally produced ropes use natural fibres like hemp, cotton or manila. The quality or grade of rope will depend on the type of material used and the process of construction. 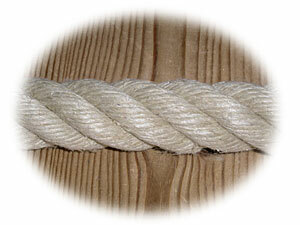 Hemp is a very stable rope, smooth looking, extremely hard wearing and tends not to show the marks. Hemp rope has a warm natural buff colour and a definite natural odour, which will vary from batch to batch, depending on the harvest. Generally, the smell will tend to disappear (or you will get used to it) after a few weeks. If you are at all unsure on this, please ask for a sample of rope first. Our 4 strand hemp stair rope is available in 24mm and 32mm diameters. 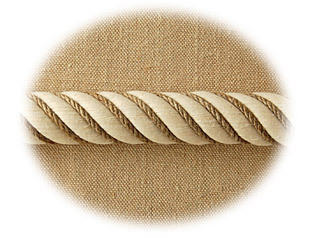 We use a superior quality hemp rope manufactured by machine to industrial specifications. This is a hard laid (tightly twisted) rope, which feels firm to hold, is highly resistant to abrasion and scuffing, and has a breaking load of 4 tons upwards - way above the requirements for a stair rope! The four strand construction enables a tighter lay to be achieved in the manufacturing process, producing a firmer rope with virtually no stretch. 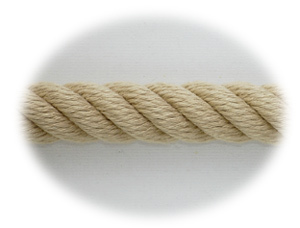 Cotton rope is softer to the touch than hemp, and is a natural (unbleached) white colour. It looks very smart and is often combined with brass fittings in a nautical setting. Care is needed to prevent marks from showing - an upholstery spray may be applied to protect the rope or, to remove small stains, a soft nailbrush with soapy water is effective. 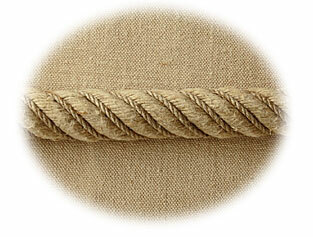 Our Cotton stair rope is - like the hemp rope we supply - a high quality 4 strand, hard laid rope. It has a particularly smooth feel to it, and is available to order in 24mm and 32mm diameter. Hemp stair rope, 4 strand - 24mm and 32mm. Cotton stair rope, 4 strand - 24mm and 32mm. 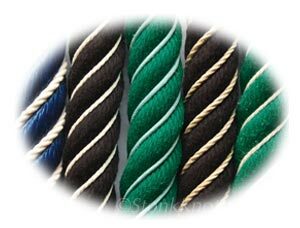 Synthetic fibre ropes are available in black, green, navy, red and natural beige. Many synthetic ropes are more weather and damp resistant than natural ropes, making them particularly suitable for outdoor applications. Our natural coloured synthetic rope for stair ropes is available in a pale beige colour and is suitable for 32mm diameter fittings. This rope is an excellent quality 4 strand spun polyester rope with a good texture and low stretch factor - the closest imitation to best quality hemp, and far superior to the widely available polypropylene based 'synthetic hemp' ropes. P.O.S.H. rope has high strength, is smooth to the touch and made with an enhanced U.V. inhibitor, making it extremely weather resistant. It was developed for the world of classic working rigs, where the combination of good looks, durability and performance are of paramount importance. We supply 24mm diameter stair ropes in 4-strand black and green P.O.S.H. and 3-strand red polyester and navy nylon. The P.O.S.H. ropes are the most durable for exterior use. The red polyester rope and nylon rope are both high quality medium-laid ropes with a 3 strand construction. The nylon rope is firm and smooth to hold, and has a satin sheen. Polyester (including high grade P.O.S.H.) rope generally has a softer texture, closer in feel to a natural rope. Although coloured synthetic ropes may be used outside, bear in mind that in bright sunlight, the colour will gradually fade and the ropes will eventually suffer from a brittling effect. The coloured P.O.S.H. 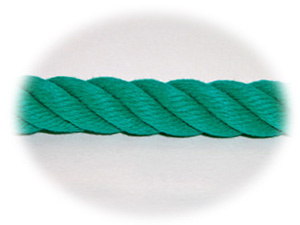 ropes are a superior polyester fibre rope similar to the natural coloured P.O.S.H ropes (above) and are not so prone to colour or fibre degradation as other coloured ropes. NOTE: Black P.O.S.H out of stock: Contact us for possible alternatives. 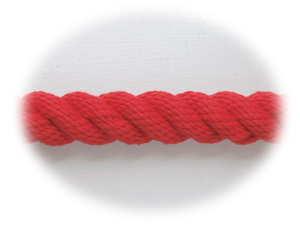 Polyester coloured stair rope (red) 3 strand - 24mm. Nylon coloured stair rope (navy) 3 strand - 24mm. Our Speciality wound ropes are hand-made and incorporate multiple strands laid together around a rope core using a technique known as "worming". "Worm and parcel with the lay, turn about and serve away"
This refrain is from the days when natural fibre ropes were treated with various protective layers to keep the water and grit from penetrating the centre of the rope. Worming a rope is twisting a smaller diameter cord into the gap between the strands of a large rope, parceling is wrapping a strip of canvas around the rope; these are both done with the lay (direction of twist) of the rope and then the serving (a continuous binding or whipping with still smaller diameter cord) is put in against the lay (ie. in the opposite direction). 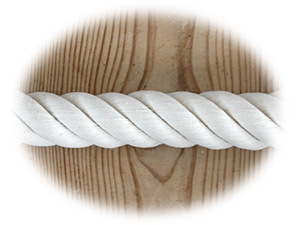 Using the traditional sailor's technique, hemp and cotton fibre ropes and cord are twisted together (or wormed) to produce an attractive two tone rope in natural shades. A synthetic equivalent in beige high grade polyester rope may also be ordered. 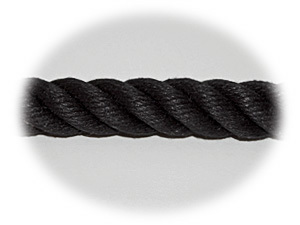 Four lengths of small diameter cord are wound into the lay of the base rope (24mm or 32mm cotton or hemp). We supply a natural hemp stair rope wound with cotton or hemp cord and an unbleached cotton stair rope wound with hemp cord. Our wound ropes are not on coils, but are individually made to length. 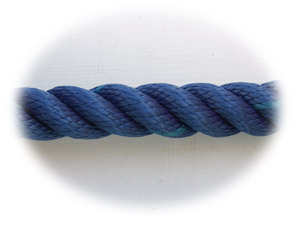 Examples of these wormed ropes are shown here in a variety of fibres and colours. 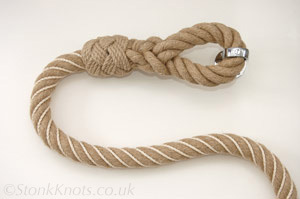 Other combinations of ropes can be made to order. Contrasting colours are often chosen to complement a particular theme - for example, a navy and cotton design works well for a nautical setting, particularly when combined with brass fittings.You can see an example of this at the bottom of the measure page. Three or four smaller diameter strands of 4mm cotton or 3mm polypropylene are wormed by hand around a 24mm synthetic rope core. These ropes require 24mm fittings. There is a choice of black or green p.o.s.h. rope with 4 strands or red polyester or navy nylon with 3 strands. Any of these may be wound with a variety of different colours and types of cord, including cotton, black, gold and green. Shown left, from left to right, navy nylon ww cotton, black posh ww cotton, green posh ww aqua cotton, black posh ww hemp and green posh ww cotton. Contact us for choices of colours and materials. All of our ropes are suitable for indoor use. For an outdoor rope handrail, or in high humidity environments, the reccommended rope to use is p.o.s.h. as it is the most resistant to both sunlight and water. Synthetic ropes are impervious to moisture which is why they are so prevalent nowadays but most of them bleach and become brittle in the sunlight. Untreated natural ropes will have a shorter life if used outside, as they tend to trap moisture in and rot from the inside. For more information on the use of ropes for exterior installations, see our f.a.q.s page. Windings on speciality ropes are added on after the manufacturing process as a decorative extra. These ropes therefore tend to be less hard wearing than the standard ropes, and are generally unsuitable for outdoor settings - if a wound rope were to be used at sea it would be "parceled", meaning wrapped in canvas. When handling the wound ropes, it is important to maintain the 'lay' (direction of twist in the rope). If the rope starts twisting against its natural direction it will kink, and the windings will lift and could become dislodged. Handling the rope is fairly intuitive, nevertheless extra care should be taken during the installation stage to ensure the rope does not twist in the wrong direction. We include a printed installation guide with all our wound ropes. For everyday use, a long speciality barrier rope would need particular attention and should be properly coiled when not in place. A wound rope used as a stair rope would not be affected because the cross screws in the brackets stop the rope from twisting. To measure up for a stair rope, and further advice on installation, see our guidelines on the measure page. p.o.s.h. ww cotton, cotton ww hemp, hemp, hemp ww cotton, p.o.s.h. Eyespliced stair rope in hemp wormed with cotton.